GENEVA, SWITZERLAND – On Wednesday, March 5, 2014, Samantha Horn, AIPR’s Director of Policy and Planning, presented the history and accomplishments of the Latin American Network for Genocide and Mass Atrocity Prevention to civil society organizations and representatives of the international community. The event was held to consider and share best practices in the creation and consolidation of mechanisms for prevention and early warning of genocide and mass atrocities, such as regional support among states. During her presentation, Ms. Horn highlighted the Latin American Network as a mechanism of awareness, education, mutual cooperation and action in the prevention of genocide and mass atrocities. 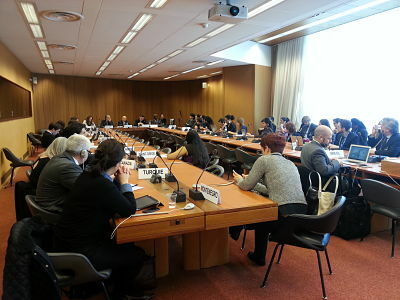 The Permanent Mission of Ecuador to the UN in Geneva organized the briefing as a side-event to the 25th regular session of the Human Rights Council. 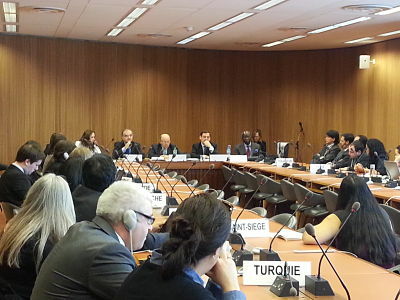 Other speakers included Ambassador Alberto D’Alotto, Permanent Representative of Argentina to the United Nations in Geneva, Minister Patricio Utreras, the Director of the Department of Human Rights in the Ministry of Foreign Affairs of Chile, and UN Secretary-General’s Special Adviser for the Prevention of Genocide, Adama Dieng. Ambassador Luis Gallegos Chiriboga of the Permanent Mission of Ecuador moderated the discussion. According to Ambassador Gallegos Chiriboga, “This event was well placed in the 25th session of the Human Rights Council meetings in Geneva, as the protection and promotion of human rights contributes to the long-term prevention of genocide and mass atrocities.” In her remarks, Ms. Horn framed the Network as part of a regional approach to genocide and mass atrocity prevention capacity building, one that is spearheaded by the 18 participating member countries themselves. Launched in March 2012, the Latin American Network remains the world’s first regional initiative to foster capacity building and policy development in the field of genocide and mass atrocity prevention. Members include Argentina, Bolivia, Brazil, Chile, Colombia, Costa Rica, Dominican Republic, Ecuador, El Salvador, Guatemala, Honduras, Mexico, Nicaragua, Panama, Paraguay, Peru, Uruguay, and Venezuela. Among its goals, the Network aims to foster the development and implementation of a genocide prevention curriculum into all participating institutions of Member States in the Network. The two-hour event was attended by a number of Latin American states, including Mexico, Uruguay, Peru, Paraguay, plus those from other regions, including Belgium, Australia, Canada, and Montenegro, among others. Representatives from prominent NGOs were in attendance as well.